5 Online Meme Generators to Create Internet Memes - 5FOUND ! According to Wikipedia, the term Internet meme is used to describe a concept that spreads via the Internet. Internet memes can include but not limited to stories, quotes, images, videos. Usually, images boards are where most Internet memes are born and the following meme generators to be introduced will mainly enables you to create image memes. An image meme consists of a character and a caption. When making a meme, you can just choose a character that is already popular and recaption it with your own words, or you can use your own image and caption it.To make a meme go viral, you will need some creativity and humor. 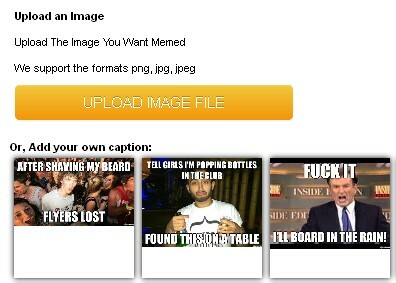 Now check out the following online meme generators and have a try, may be the next thing to go viral will be from you. Memegenerrator.net allows you to generate an image from an existing character by searching from their database and then recaption it. There you can find the most popular characters and images to recaption. If you prefer not using those popular images, you can click “create a new character” on the left sidebar, then search an image from Google, or upload an image from your computer or enter an image url, which will be used as your character. Then you can adjust the background and appearance of your images using their tools and after that, you can caption it. On Quickmeme, you can also browse their popular characters or images and recaption them. You can also upload your own images and create a new one. Different from others, which only allows you using two lines of captions above or below the characters, you have different styles, positions for your captions. The new feature also allows you to upload animated GIF for captioning. diylol offers a pretty simple way to submit your meme, simply give it a title, upload your image, add two lines as captions then hit “post”. you are done! Besides,you can view what other’s have created and recaption them with your own humor. Zipmeme allows you to upload an image from your computer in PNG, JPG or JPEG to use it as your characters, or you can browse their popular characters and recaption them. You can search an existing one or browse by featured, random etc. Its caption tools allows you to choose different text styles, size and alignment of text. Also, you can decide whether you want to make your meme public or not. Memecenter offers a lot that others don’t have. You can make your memes in using various tools. For example, you can upload an image from you computer, or specify a YouTube url to make one and if you would like to make an animated meme, you can use its GIFMAKER.